After analyzing hundreds of SERPs over the past few weeks, Rand has identified the 10 distinct content types that work best for SEO and classified which formats are suited for certain queries. In today’s Whiteboard Friday, he explains those content types and how to use them to satisfy searcher intent, match them to the right projects, and enhance your overall strategy. Howdy, Moz fans, and welcome to another edition of Whiteboard Friday. This week we’re going to chat about the types of content, content formats that tend to work well for SEO, and I’m talking specifically about content rather than sort of an e-commerce product page or a contact page or those types of things, and that’s because what we want to try and do here is talk about those of you who are doing content strategy and content marketing and choosing which content formats you should potentially use. 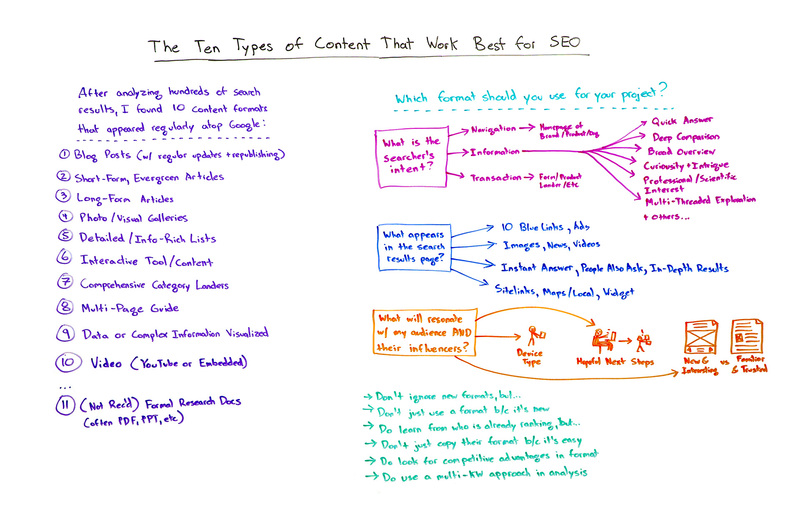 So I actually spent a bunch of time over the last few weeks analyzing a few hundred search results, of many, many different kinds, trying to identify the unique, diverse kinds of search results in which content marketing pieces ranked or the types of pieces that would fit into the content marketing world rank. Photo and visual galleries, I found a lot of these ranking, especially for things that lent themselves to it, for example if you were to search for men’s haircuts styles. Interactive tools and content, got some good examples of those. Comprehensive category landers, so this would be like if you search for kitchen designs, how you might land on Houzz’s page of various kitchen designs and that’s really a lander to get you into more content, so it’s not technically a content marketing piece by itself, but it leads you into content pieces or could. Multi-page guides, things like Moz’s Beginner’s Guide to SEO, but we have some other examples too. Video, YouTube or embedded video on a particular page, Whiteboard Friday itself being an example of that. Then an eleventh format that I don’t actually recommend, even though I found it in the search results quite often, and that is the formal research documents that are usually PDFs or Powerpoints or those kinds of things. The reason I don’t recommend these formats is because they’re actually hard to parse. They’re particularly hard to open on mobile devices. They’re not very user-friendly, and most of the time the reason they rank well is simply because they’re cited by lots of other things. But when you see content marketers invest in one of these spaces and make a document in one of these other formats that’s better and more comprehensive and more useful and more user-friendly, they do a much better job and they tend to rank better too. Which format should you use for your project? What’s the searcher’s intent? What are they trying to accomplish? A deep comparison of different types of information or different products, different services, different paths that I could choose to answer the action that I’m about to take. I could be searching out something, searching for information purely out of curiosity and intrigue. You know when you go down a rabbit hole around, “Hey, I want to know all the films that Meg Ryan was ever in.” Then, “Wait a minute. What is that one? I’ve never heard of that one, and let me go learn more about that.” So the curiosity and intrigue. What actually appears in the search results page? Photos or visual galleries or maybe data or complex information visualized, like maybe an informational graphic or more likely a data visualization that’s of high quality. I’m not a big infographic fan myself, as you might know from previous Whiteboard Fridays. Is it news? In which case, maybe I want a short-form article or a long-form article. Is it videos? In which case, I probably want to video. Instant answers, people also ask, in-depth results, that could point us toward the complexity of the information and how much people are willing to go dig into this. So people who also ask suggest that it might be a multi-threaded exploration, a multi-page guide, or a comprehensive category lander could be a good match there. If I see an instant answer, probable that a short-form, evergreen article could do really well, or a blog post that’s regularly updated might do well there. Site links, maps or local, or one of Google or Bing’s widgets, that essentially answer the query for you, a search for a calculator or a search for flight prices, they answer that already. A search for weather, they answer that already. Chances are it might be pretty hard to do things in the content marketing world that will actually have success there. I might bias you to look for other things. What’s going to resonate with two groups — my audience and their influencers? Device type and where you are searching from. So if somebody is searching on a mobile device and they are on-the-go and this type of query has an intent that is informational but it’s very quick information, you might want to consider some of the shorter form stuff. If there are hopeful next steps and you know that that’s the case, you might want to give something like the multi-page guide or the category lander or the interactive tool or content or that detailed list that gives someone actions they can take right after they’ve consumed that information. looking for something familiar and trusted, that is not new, that doesn’t make them think at all, it just answers their query and gets them finished. Don’t ignore new formats. So if some of these are not things you’ve considered in the past, don’t ignore them. Recognize that you shouldn’t just use a format because it’s new. That is a terrible idea. You should use a format because it works well for your audience, because it serves all of these functions. I wouldn’t say that you should just copy somebody else’s format because it’s easy to do and familiar. Make sure that familiar and trusted is the best way that you can compete. Look at these content formats and finding ways to get a competitive advantage from them. If all of your competitors are just doing blog posts and short-form and long-form articles, you might be able to win with a visual gallery, you might be able to win with an interactive piece of content or a tool, or you might be able to win with complex information visualized. That’s a powerful thing. Do use a multi-keyword approach in this analysis. So when I’m saying, “What is the searcher’s intent,” I’m asking you to consider all of the words and phrases that you’re hoping to rank for with this piece of content, not just a single keyword term or phrase. That will give you the best way to choose the right content format for the search queries and the overall goal of attracting the right searchers. All right everyone, look forward to hearing about some of the formats you’ve used, maybe some that aren’t on this list. If you have great examples of these you’d like to share, we’d certainly love to see them. And we’ll see you again next week for another edition of Whiteboard Friday. Take care.